The U.S. Air Force's secretive robotic X-37B space plane mission continues to chalk up time in Earth orbit, nearing 430 days of a spaceflight that — while classified — appears to be an unqualified success. The space plane now circuiting Earth is the second spacecraft of its kind built for the Air Force by Boeing’s Phantom Works. Known as the Orbital Test Vehicle 2, or OTV-2, the space plane's classified mission is being carried out by the Air Force Rapid Capabilities Office. The robotic X-37B space plane is a reusable spacecraft that resembles a miniature space shuttle. The Air Force launched the OTV-2 mission on March 5, 2011, with an unmanned Atlas 5 rocket lofting the space plane into orbit from the Cape Canaveral Air Force Station in Florida. General William Shelton, commander of Air Force Space Command, briefly saluted the high-flying X-37B space plane on April 17 during his remarks at the 28th National Space Symposium in Colorado Springs, Colo. In a follow-up meeting with reporters, Shelton told SPACE.com: "It's doing wonderful." When asked specifically about when the craft will be brought back down to Earth, Shelton's response was guarded. "When we're through with it … it's going great," Shelton said. U.S. Air Force Maj. Tracy Bunko, the Pentagon's spokesperson for the X-37B project, told SPACE.com that the space plane's current mission "is still on track … and still ongoing." Bunko said that a third flight of an X-37B spacecraft — slated for liftoff this fall — will use the same craft that flew the first test flight, the OTV-1 mission, back in 2010. That maiden voyage of the X-37B space plane lasted 225 days. It launched into orbit on April 22, 2010, and then landed on Dec. 3, zooming in on autopilot over the Pacific Ocean and gliding down onto a specially prepared runway at Vandenberg Air Force Base in California. Each X-37B space plane is about 29 feet (8.8 meters) long and 15 feet (4.5 meters) wide. It has a payload bay about the size of a pickup truck bed and is outfitted with a deployable solar array power system. Last March in a Washington, D.C., briefing with reporters, Shelton advised that the winged, reusable robot plane is a vehicle the U.S. Air Force wants to keep using. But there is currently no go-ahead to add space planes (beyond the two already built) that would increase the fleet size, he said. When the second X-37B cruised by its one-year milestone in orbit in March, Lt. Col. Tom McIntyre of the Air Force Rapid Capabilities Office lauded the spacecraft's endurance run. "We are very pleased with the results of ongoing X-37B experiments. The X-37B program is setting the standard for a reusable space plane and, on this one-year orbital milestone, has returned great value on the experimental investment," McIntyre said. "Upon completion of all objectives, we look forward to bringing the mission to a safe, successful conclusion." According to Ted Molczan, a Toronto-based leader in a network of amateur skywatchers that keep an eye on the whereabouts of spacecraft, the X-37B/OTV-2 has maintained its orbit since mid-August of last year. Last observed on April 22 by fellow skywatcher Greg Roberts of South Africa, the craft was in a 42.8 degree, 332 kilometer by 341 kilometer orbit, Molczan told SPACE.com. "It makes frequent small maneuvers to maintain that altitude against the significant atmospheric drag that is present. That orbit causes its ground track to repeat nearly precisely every two days," Molczan added. "Ground tracks that repeat at intervals of two, three, or four days, have long been favored for U.S. imagery intelligence satellites, so this may be a clue to the mission of OTV-2," Molczan said. Scaled-up X-37B space planes planned? An intriguing sidelight to the X-37 program is whether or not Boeing's Phantom Works is keen on using the spacecraft for other, nonmilitary missions, or even upgrading the X-37 space plane concept for human spaceflight. Last year at Space 2011, a conference organized by the American Institute of Aeronautics and Astronautics (AIAA), an X-37B derivatives plan was sketched out by Arthur Grantz, chief engineer, Experimental Systems Group at Boeing Space and Intelligence Systems (S&IS) in Seal Beach, Calif.
Grantz detailed a vision for the spacecraft and scaled-up versions to support space station cargo deliveries and even carry astronauts into orbit. At the one-year milestone of the now orbiting X-37B, SPACE.com contacted Boeing for more information on Grantz and his view on use of X-37B evolving to support the International Space Station. 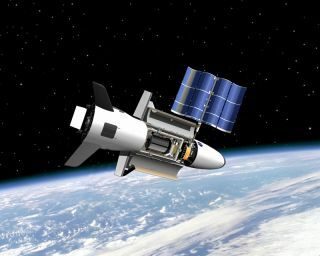 "That AIAA presentation was a one-time event and we are not saying anything more publicly about the X-37B," said Diana Ball of Boeing’s S&IS Communications in a response to SPACE.com. "Sorry we cannot help you out this time."